← The “Q” in Question. The protocol looks something like this: Win a race, get kisses from the podium girls, shake hands with the Badger, and then wait for journalists to question the legitimacy of your performance. (VeloNews, 9/16/13). Cycling’s 41-year-old Grand Tour champion! Fortunately, aside from the “drug testing mix-up” that was quickly deemed no fault of his own, there’s been very little if any rumbling throughout the week about “legitimacy” in this case. As such it looks like we really can commend a remarkable accomplishment for what it is, even in a sport that at this point in time cannot be trusted, sadly yet understandably enough. Those who see an age limit on athletic victory will probably want to reconsider their outlook. 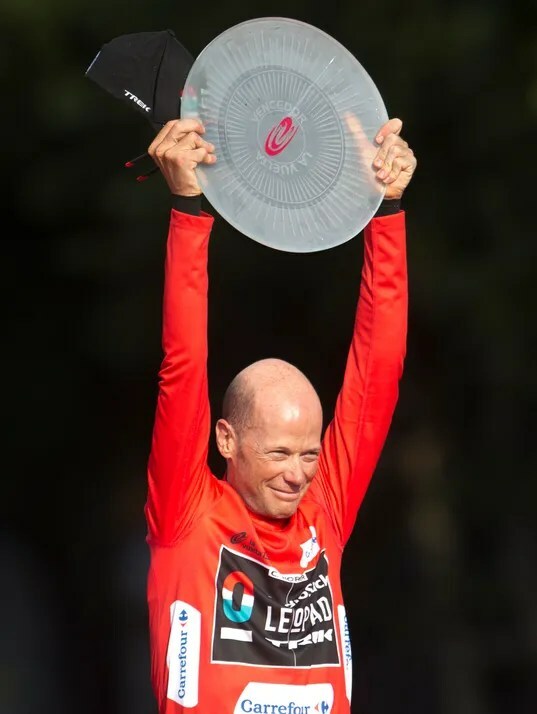 One week on, the headline can now be repeated with all the more confidence: 41-year-old American Chris Horner— close to 42 no less– has won the 2013 Vuelta a Espana. Not only is he the first American in history to capture Spain’s annual three-week cycling race, but the Oregon resident has also become by far the oldest rider ever to win one of cycling’s three Grand Tours– the other two of course Le Tour de France and Giro d’Italia.